This indiscriminate use of gas was typical of the government’s tactic of preventing mass peaceful demonstrations by provoking violence and spreading fear. For example, “black block” casseurs and rock throwers have been identified as under-cover policemen by eyewitness and on videos. This was apparently the case last Saturday at the Montpellier Préfecture. 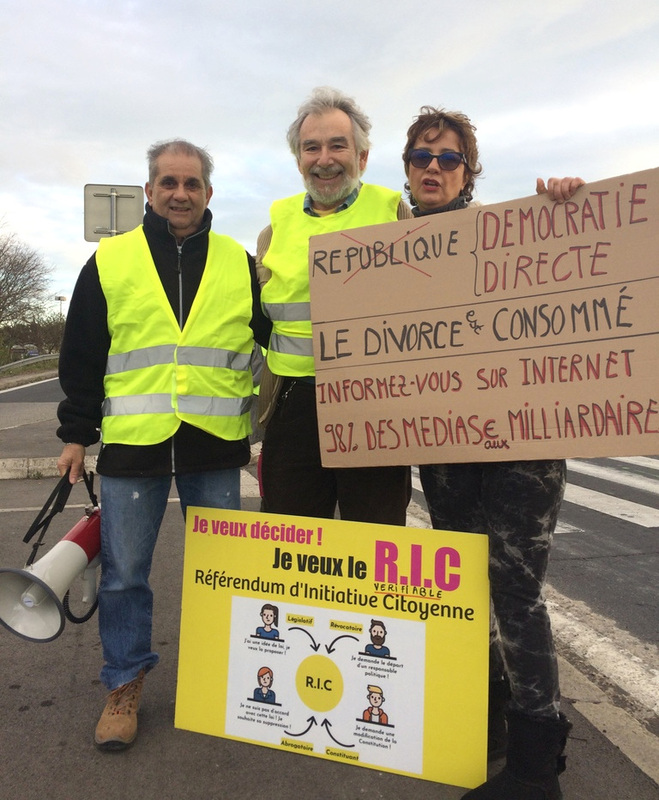 Meanwhile, my wife and I were out with the Yellow Vests at the main roundabout into Montpellier, where two thirds of the passing drivers were displaying yellow vests, giving the high-sign, or honking their approval. So much for the Yellow Vests decline in popularity. The sign we were handed shows the word “Republic” crossed out and replaced by “Direct Democracy. The Divorce is Consummated.” Then: “Inform yourselves by Internet. 99% media owned by billionaires.” (see attached photo). At the same time, we were getting regular cellphone reports from downtown of tear-gassing continuing all day, capped by the triumphal arrival of more than 80 Yellow Vest motorcyclists who took over the main square as evening fell. Similar actions, on a larger scale, were taking place in Paris, where, in a successful ruse, the Yellow Vest Facebook page convinced the police that they were going to attack the royal chateau out at Versailles, where hundreds CRS riot police were moved. In fact, the Yellow Vests organized a last-minuet, fast-moving wildcat march that began in Montmartre, snaked through the capital ahead of the police, and was only stopped at Macron’s Elysée Palace, heavily invested by the “forces of order.” At the very same time, the National Assembly in Paris was hastily approving a “Yellow Vest Law” designed to recognize their protesters’ grievances and embarrass President Macron, a number of whose party members voted with the majority. A measure of the President’s popularity. To be sure, the Yellow Vest demonstrations in Paris and the provinces yesterday and last Saturday (Dec. 15) were smaller than the previous four Saturdays. The reasons for this decline are obvious: 1. Massive police violence 2. The concessions already won from President Macron (who had vowed never to make any), 3.The shocking Dec. 11 terrorist killings in Strasbourg, 4. The pro-government bias of the media, and 5. Winter vacation (sacred in France). So I’m not sure this decline in numbers means the movement is “petering out” – as the talking heads in mainstream media keep proclaiming with undisguised relief. In any case, one thing is certain. The French establishment, nonplussed by an incomprehensible leaderless movement which refuses to be co-opted back into the system, has reacted crudely with an onslaught of violence and lies. Although partly successful, these repressive tactics have also backfired in a serious way, depriving the French political class, already weak and divided, of its legitimacy and threatening its hegemony. Let’s take a closer look at this campaign of state repression and establishment propaganda. The unprecedented violence unleashed by the “forces of order” over the previous five Saturday gatherings, invisible in the mainstream media, has been taking its toll on activists, as videos of police brutality and hideous injuries circulate on YouTube, on alternative new sites like Médiapart, and through the Yellow Vest Facebook pages. These new tactics, officially named PROJECT FEAR, were explicitly designed to intimidate. So are the harsh sentences imposed on Yellow Vest demonstrators arrested as casseurs (vandals) for as little as possessing bike helmets, gas masks, and ski goggles considered “evidence” of “conspiracy” and “intention to attack the forces of order.” These items are now so common, that the local Bricorama (“Home Depot”) strategically displays ski goggles right next to yellow emergency vests, yet such demonstrators are routinely herded straight from the street into Room 24, a 24-hour emergency courtroom where they are sent to jail after summary trials. From the very beginning of the movement on Nov. 27, Yellow Vests have been systematically repressed by the government through massive use of tear gas, flash bombs, pepper spray, water canons and police truncheons. In a report published on Friday, Human Rights Watch said that France’s “crowd-control methods maim people,” pointing to cases where protesters were wounded by rubber projectiles and tear gas grenades. At the same time, the mainstream media systematically played up vandalism against property (windows broken, cars burned) during demonstrations – while failing to expose indiscriminate police brutality and the many serious injuries including the murder of an 80 year old Arab woman hit in the head with a flashball while attempting to shutter her balcony windows. Here are some gruesome pictures and videos which you may not want to look at showing what happens when police are licensed to deliberately aim their flashball and gas grenades at people’s faces. Given the demographics of the more than 3,000 people arrested thus far, few fit the stereotype of young, black-clad casseurs (vandals) and fascists, whom the government and media blame for the violence. Many of them, provincials, had in fact come out to protest (and gone to Paris) for the first time in their lives. The Yellow Vests I have seen here in Montpellier appeared mostly middle-aged. They, and their Parisian counterparts, don’t look a bit like the typical black block “anarchists” who are visible on countless videos and who somehow never seem to get arrested – although some have been filmed climbing aboard police vehicles. This contradiction might be one explanation for why, despite all attempts to castigate them as “perpetrators of unacceptable violence,” the government’s and media’s ongoing rhetoric about security has been quite ineffective. Indeed, it has mainly succeeded in de-legitimizing their authors. The contrast between official reports and those of eyewitnesses and videos on Facebook is too glaring. The narrative is always about demonstrators violently “attacking police,” however not a single injured policeman has been seen on T.V. Having seen French CRS riot squad Robocops from close up, it seems to me demonstrators fighting with them (like we did with their ill-equipped predecessor in ’68) would be like ragged peasants with clubs going up against knights in full armor. Macron’s militarized state over-reaction to a mass political demonstration breaks with a long tradition of tolerance for muscled demonstrations by rowdy angry farmers and militant labor unions. A tolerance Macron, in speeches, has blamed for the failure of previous governments to pass needed pro-business counter-reforms. On Monday evening Dec. 10, after a month of silence in the face of massive rejection of his neoliberal policies and arrogant, condescending personality, Macron finally went on TV with a lame pre-recorded speech combining threats and concessions. The “Jupiterian” President began by blaming all the violence on the protesters (“we have all seen them attacking the police”) and threatening them with severe punishment (“no indulgence”) if they persist. For the Yellow Vests, this was throwing gasoline on the fire, as everyone who had participated in the protests or had seen the horrendous videos of the systematic police mayhem deliberately unleashed by Macron knew he was lying. “The President of the rich” then went on to admit that the protesters may have had a legitimate point. “We” (the royal “we”?) “may have forgotten the single mother struggling to make ends meet” and the other little people. Macron then condescended to propose “a national conversation, which I will coordinate,” including even local mayors, about the social/economic crisis. He also made few economic concessions. These included rescinding his new taxes on social security retirement for some retirees with very low incomes, elimination of taxes on paid overtime, a call on businesses to voluntarily give a year-end bonus to their employees, and a year-end 100€ ( $115) raisse in the minimum wage. On closer examination by the Yellow Vests, this “raise” turned out to be “smoke and mirrors.” First, it applied to only some low-wage workers. Second, it was not really a raise in the hourly wage, but in fact a government bonus to encourage “active” workers, which did not include benefits and was to be paid for out of the workers’ taxes, essential moving money from one pocket to another. “Don’t give us words, give us figures” one Yellow Vest told me, infuriated at being taken for a fool (con). In his address, the monarchical President pointedly refused to pronounce the words “Yellow Vests” and “ecology” or to re-establish the Tax on Great Fortunes to pay for these concessions. Macron’s offer of crumbs from the table of the rich was immediately rejected as “too little, too late’ by the Yellow Vests, who continued calling for Macron’s resignation and a bottom-up reorganization of French democracy. “two elements merit particular concern. Firstly, his inclusion of the phrase “laïcité bousculée” (‘secularism buffeted or overturned’) in his analysis of the ills of current French society. Secondly, his reference to the ‘profound identity’ of the nation and the need, in this context, to ‘tackle’ the question of immigration. Both comments seem suggestive of an effort to inject racist and xenophobic themes into the Yellow Vest movement, the better to divide it while simultaneously making it appear that the state is listening to right-wing grievances. Indeed, from the beginning the Yellow Vests, given their origins in la France Profonde (middle France) have been smeared by the media (and rejected by much of the Left) as right-wing and racist, despite videos showing them forcefully ejecting members of LePen’s National Front from their march. Workaholic U.S. readers may have difficulty taking in the seriousness of holidays in this country, which mandates five full weeks of vacation per year, where family ties remain strong enough so that children are routinely sent to their grandparents for the Winter holiday, where train reservations are all booked up months in advance and where no place is farther than four hours from Paris. The first paid vacations were won by the French workers at the end of the 1936 national wave of sit-in strikes, and newsreels of the departures that August of Parisian worker families who had never seen the sea are part of the national narrative. Impending summer vacations were also partly responsible for the eventual collapse of the inspiring May-June 1968 student-worker rebellion. The French police have taken advantage of this factor forcibly remove the makeshift shelters and barbeques that had been a convivial feature of the Yellow Vest presence at roundabouts and toll-booths. Yet there were still a few Yellow Vests at the main roundabout here in Montpellier on Christmas eve, and a downtown rally announced for this Saturday, Dec. 29, came off peacefully, although there was gas elsewhere. Meanwhile, Yellow Vests descended onto the tracks at the Montpellier railroad station and blocked trains. Like all the spontaneous mass uprisings that dot French history going back to Feudal times, the Yellow Vest revolt was initially provoked by unfair taxes. Spurning all established political parties, and unions, the Yellow Vests got organized on social media and acted locally. The broadcast media, although highly critical, spread the news nationally, and the movement spread across France, blocking intersections, filtering motorists, allowing free passage at highway tollbooths, and gathering to demonstrate, more and more numerous and militant, on successive Saturdays. Why Saturdays? “I can’t go on strike,” explains one woman. “I’m raising three kids alone. My job, that’s all I have left. Coming on Saturdays is the only way for me to show my anger.” Women – receptionists, hostesses, nurses-aids, teachers – are present in unusually large numbers in these crowds, and they are angry about a lot more than the tax on Diesel. Like Trump, Macron has showered corporations and millionaires with huge tax cuts, creating a hole in the budget which he has compensated by cuts in public services (hospitals, schools, transit, police) and by tax increases for ordinary people (up to 40% of their income), large numbers of whom are struggling hard to make ends meet and going into debt. On Dec. 6, in direct response to an appeal for calm from Macron, the leaders of the CGT and all the other labor federations except for Solidarité signed a Déclaration of solidarity — not with the injured and arrested demonstrators, but with the Macron government as the representative of the peaceful republican order! In return for what many have described as a “betrayal,” these professional negotiators accepted Macron’s invitation to “resume the social dialogue” — that is to sit at the table with him and negotiate more “give backs” of workers’ rights. The next day, contradicting themselves, the CGT’s Martinez and the other union leaders called for a national labor demonstration on Fri. Dec 14 covering the same basic economic demands as the Yellow Vests but not on the same day, Saturday Dec 15. Needless to say, only a few stalwarts came out for Martinez’s much touted demonstration. Yet clearly, only with the active participation of France’s organized workers can this broad popular movement succeed — for example through a general strike — in bringing the capitalist class to its knees and founding a new social order. So apparently the Yellow Vest movement is not exactly “petering out.” After six weeks of daily roadblocks and disruptions in every corner of France, and after six (now seven) successive mass demonstrations of hundreds of thousands in Paris and the provinces, violently repressed, this spontaneous, self-organized rebellion, coordinated via social media, is still seriously challenging the political and economic order in France. Not only has this rebellion persisted despite unprecedented police brutality, media misrepresentation, and rejection by labor union officials, it has retained its grass-roots popularity and deepened its goals – from an initial rejection of a tax increase on Diesel fuel to explicit rejection of the established political/economic system and to near-unanimous call for the resignation of Macron and the creation of a new kind of democracy via referendum or constitutional convention. Moreover, the French students have joined the uprising, protesting Macron’s introduction of anti-democratic selection in college admissions, with 170 high schools disrupted in answer to the “Black Tuesday” appeal by their union. There has also been a revival of strikes and protests among civil servants, nurses and educators, all inspired by the Yellow Vests’ success in wringing concessions from Macron, whose onslaught of pro-business, neo-liberal counter-reforms organized labor, hamstrung by its collaborationist leaders, failed to stop last Spring. The apparent rift with the ecological movement has been breached as demonstrations from the two movements combined in action under the slogan “End of the Month/End of the World: Same Cause/Same Enemy.” Likewise, marchers from the feminist “End Violence Against Women” have been honored and welcome by the Yellow Vests. Meanwhile, the epidemic of Yellow Vest inspired revolts has spread to Belgium, Great Britain, Portugal, Holland, Hungary, Iraq, Lebanon, Egypt and beyond, recalling the Internet-propagated contagion of the 2011 Arab Spring and “Occupy” movements and even provoking the Egyptian military government to ban the sale of yellow emergency vests. But the numbers are smaller. See video of German Amazon workers wearing yellow vests during their annual Christmas attempt to strike and disrupt the company’s profits during the busiest time of the year in an international effort that includes Polish Amazon workers. Clearly, to achieve ultimate success this spontaneous, self-organized, uprising of the 99% against the 1% will have to unite internationally as well as to continue to deepen itself, to grow and to mutate – like similar popular movements in the history of France from the Jacqueries of the Middle Age through the Sans-culottes of 1789, the social-republicans of 1848, the Communards of 1871. Armed with social media on which to coordinate mass actions and to debate goals and methods from the local to the national and international levels, there is no technical reason why this self-organized insurrection cannot surpass the uncoordinated movements of 2011 and take root everywhere. So far, as far as France is concerned, the missing political elements are the full participation of the industrial working class and of the North African and African immigrant population, which have not yet showed up en masse. Only the future will tell how far this movement will go, but already its achievements are impressive and permanent. The Yellow Vests have succeeded in unmasking and discrediting Macron, the neo-liberal wunderkind who was supposed to Thatcherize France and is now so hated that the remaining years of his mandate are in question. The Yellow Vests have also unmasked and discredited the mass media, particularly television networks, which had supposedly hypnotized the ignorant masses who now see them as corrupt, overpaid propagandists for the billionaire class. The Yellow Vests have also succeeded – wonder of wonders! – in unmasking and discrediting the hegemonic myth of representative “democracy” with its unrepresentative “political class” of professional politicians of right left and center. These genies can never again be put back in the bottle. Amazing achievements for a movement that is only seven weeks old and still growing. The hegemony of the French ruling classes is hanging by slender threads of increasingly counter-productive violence and lies. The French popular masses, already famous for their anger and cynicism, are furious at being taken for fools by their betters and joyful at feeling their own strength and solidarity. No one knows where all this will end. A Joyful 2019 to all! Richard Greeman is an activist who was in Paris in the late ’50s and a member of the legendary revolutionary group Socialisme ou Barbarie, with Castoriadis and Lyotard. He is based in Montpellier, and is best known for his translations of the Franco-Russian novelist and revolutionary, Victor Serge.